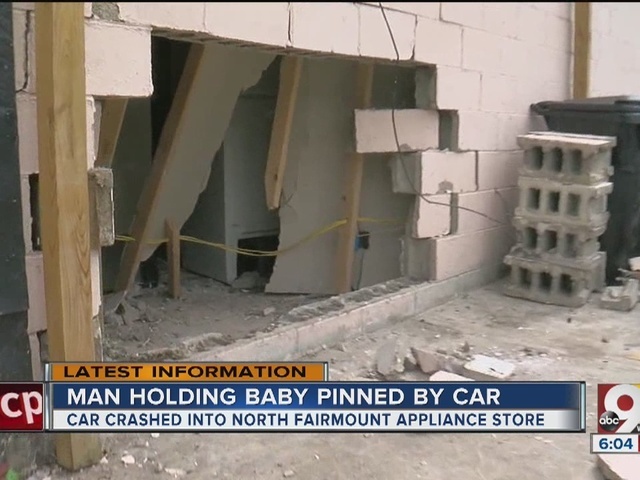 CINCINNATI - A 7-month-old girl and her grandfather were lucky when a car careened into his store in North Fairmount Wednesday afternoon. Lawrence Perkins said he was holding his granddaughter Rose when a car crashed through the side of the building and pinned them between a 700-pound pop machine and a washing machine inside Northside Queen City Appliances on Harrison Avenue and White Street. "The baby was kind of sitting by herself, and we were playing with her, and I picked her up. Thank God," Perkins said. Rose and her mother, Victoria Perkins, who was also in the store, were not hurt. But it was a frightening scene for the mother. "I saw the refrigerators starting to move and I got scared. And at first it didn't register to me that all that happened. Then when it registered, I started to freak out 'cause all the dust started coming and I was like, 'Get me out of here,'" she said. The impact of Perkins' body dented the pop machine. Perkins said he doesn't have any broken bones and he wanted to help repair the hole in the wall before going to a hospital to be checked out. He said he did have soreness in his shoulder, back and stomach. 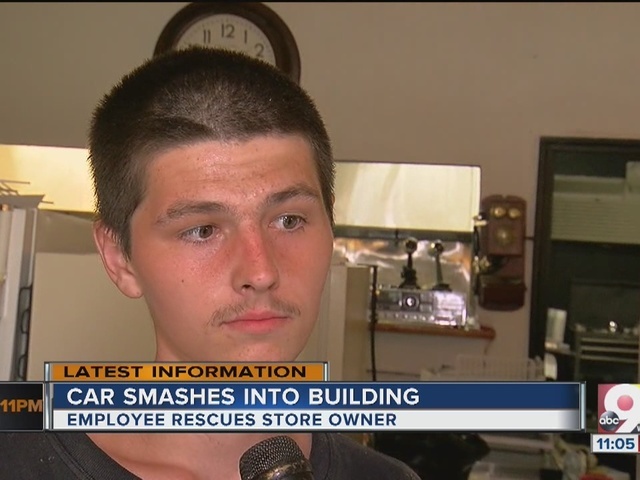 Two cars collided and a third was trying to avoid the crash when it careened into the store. Perkins said he had the baby in his arms and was going to the door after hearing the first accident when the car crashed into the wall. Perkins said there's thousands of dollars in damage to the building. He does not own it and just relocated his business there in January. He said the vending machine, a washing machine and a fridge were damaged. According to the police report, a car going west on Harrison crossed the center line and struck an eastbound car. Christopher Yarocki, 22, was cited. The driver behind the wheel of the car that crashed through the wall said Wednesday night that she was only trying to avoid an accident when she swerved off the road and that she was suffering from minor burns caused by the airbags in her car.